Elvis went to Dr. Ragan's all ready for surgery. Dr. Ragan took a hard look at how he had improved on this walking and we took another set of X-Rays and had Elvis walk all over the clinic and outside in the grass. After reviewing the new X-rays and manipulating th elbow, Dr. Ragan feels that Elvis should keep his leg!!! He has a limp, but the nerve damage has made the elbow numb. The breaks in the lower part of the leg have healed and the elbow may fuse, but Elvis can put his foot down and he has feeling in the paw!!! Great news for the little man, and he celebrated by running around the clinic and eating all of the cat's food and drinking all of Norman's water. We are all so happy for the baby boy! Elvis is now getting more exercise and is off of crate rest only. He can jump in the sofa and can negotiate stairs. We are working with him every day to make him stronger. We are ready to review applications for a new forever home for the pup! Thanks to everyone who has worked so hard to give Elvis the best chance! Elvis is a 6 month old puppy. He has a multiple fractures in his right front leg. Since it wasn't treated, he has nerve damage and the leg is not salvageable. 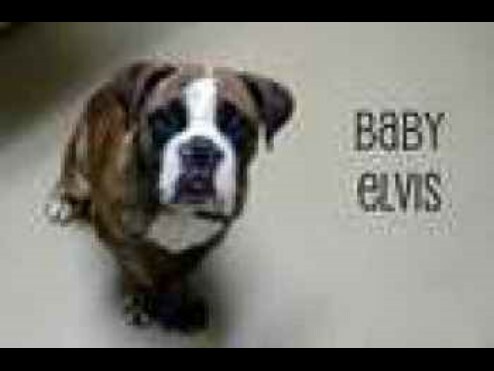 Baby Elvis is scheduled for surgery on Thursday and will have the leg removed. He should be aqble to do just about anything that a 4-legged dog can do! We will keep you updated on Elvis's progress and treatment.